An offsider guides the auger to a place marked for digging. Fencing – and especially good fencing – is like a freemason’s handshake in a traditional farming community; without it, you can’t join the club. Tree lined avenues and quirky mailboxes hold no stock I’m sad to say. The eye that expertly finds a culler in the flock has also been trained to analyse your fence. The judgement that is made of you from a casual glance can be grave indeed. Good, bad or indifferent – the fence is the yardstick by which all is measured. Good equipment and materials mean good fences. Firstly, you need an offsider. It is their job to assist with lining up the posts and generally sharing the burden of lifting, shoveling, ramming, bleeding and swearing. Two people also make the job safer, which, as I will discuss, can be very dangerous. Secondly, there is the crowbar – its high lustre an unwholesome shellac of blood, sweat and epidermis. Only slightly less reviled is the post hole shovel, with a handle usually sufficiently disintegrated to reward its user with 3 or 4 eyewatering splinters per day. Next is a tractor and front end loader. This is no joking matter. There are some awful statistics involving tractor accidents on farms so always use a mature, experienced offsider and ensure you understand the safety issues; read your SOTA tractor safety manual regularly. A 4-in-1 front end loader is brilliant for handling posts. If you don’t have a 4-in-1 loader, a suitably attached snig chain is useful for manoeuvering posts into position. Working as a team, your offsider becomes your dogman and is completely in charge of giving signals, standing well clear for safety. 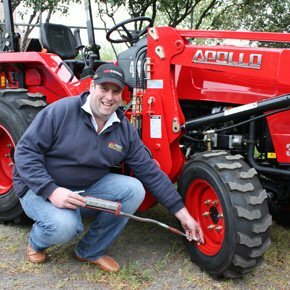 Attach a post hole digger with auger to your tractor to dig the holes – or alternatively you could use a shovel. Realistically, you will be continually hopping on and off the tractor, nudging forward and back and working with and around the front end loader. It is very easy to get blasé or accidentally brush a control; your concentration is paramount to avert mishaps. You need to drop a strainer post in at the corners – or where you want to break the fence or swing a gate. These should be big, solid and buried deeply. Due to their size, it is likely that the post hole you’ve created with the digger will have to be widened, cleaned out and deepened. A system of stay posts is usually employed to further reinforce the strainer posts. It is undoubtedly a good idea to investigate different straining techniques on fences that are bearing similar weights and select uniformly sized strainers, stays and posts for ease of measurement. Great care should be taken to remain well clear of the auger when it is operating. The strength, height and design of the fence should reflect the type of stock you wish to keep. Although cheap and easy to work with, a 6” treated pine log will easily snap if a 700kg bullock gets pushed into it. The next step is to run a guide wire between the strainer posts. Upon tightening, you’ve got a perfectly straight line. 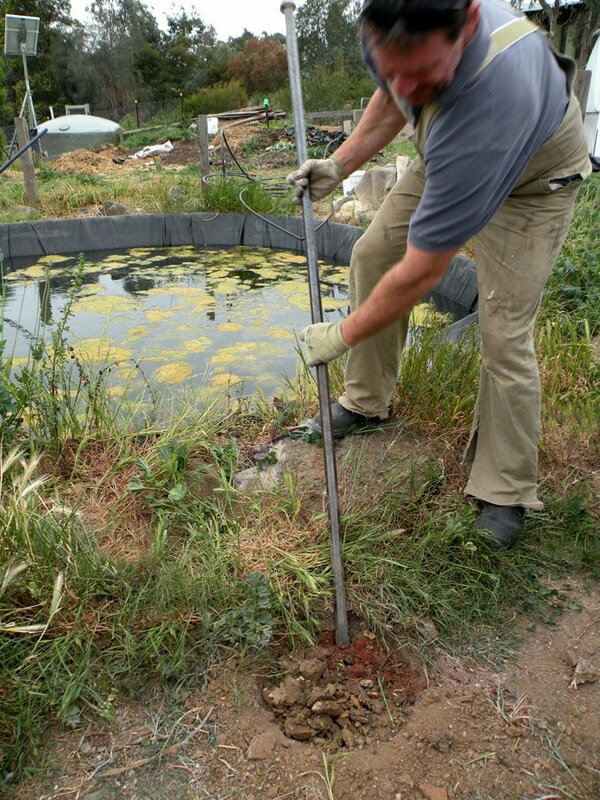 Calculate your distances between posts and clearly mark with your post hole shovel where you need to bore a post hole, directly under the wire. Don’t forget to move the wire out of the way before sinking the post holes. Having dealt with the strainer posts, you will better understand the importance of getting your post holes just right. 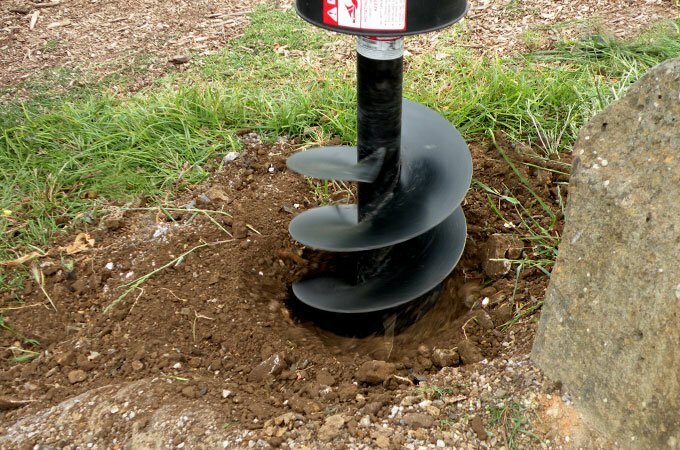 It’s a good idea to mark a suitable depth on the auger. The less you have to clean out the holes or backfill, the better. Having an appropriate sized auger will also help. Once the post is positioned, you don’t want to have to ram a great pile of dirt back in with the crow bar; an arguably worse job than cleaning to hole out. It is best to back the tractor 90 degrees to the fence line. This enables your offsider to line you up whilst maintaining a clear view of the fence line. 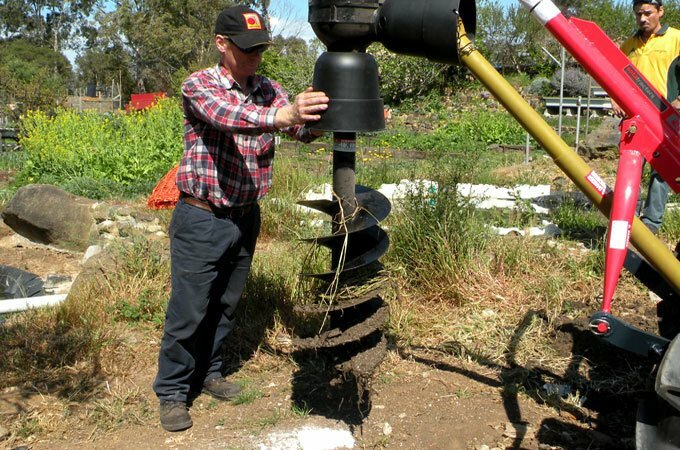 To fine tune the auger’s position, someone will have to physically move the implement. This is where there is potential for serious injury. If in doubt, turn the tractor off. Great care should be taken to remain well clear of the auger when it is operating. Again, let your offsider control the signals. Verbal commands are pointless when using a noisy tractor. Devising methods of adding weight to increase the post hole digger’s down force are not recommended. If you are experiencing difficulty in penetrating the soil, use the crowbar to break it up. The same goes for encountering submerged roots and rocks. Continue to align your posts as you begin refilling the hole and ramming the earth. Once you are satisfied, ram it home. As you progress you’ll become expert at it – so much so in fact, that one day – after your fence is finished, as you pass through a farm gate, you’ll inexplicably glance down the fence line, marvel at the fading callouses on your hands and think………..did I really do all of that?